Last week, former FBI Director James Comey confirmed what many of us have known all along: that the Trump administration is crooked. 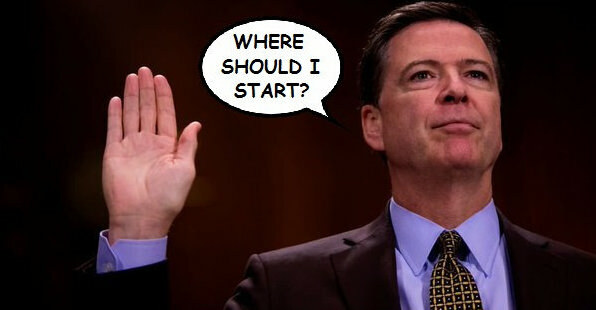 On June 8, 2017, Comey testified before the Senate Intelligence Committee that he believes he was fired because of the Russia investigation. “I was fired in some way to change or the endeavor was to change the way the Russia investigation was being conducted,” Comey asserted. If true, that would mean that Trump is guilty of obstruction of justice—a very real and punishable crime by law. Interestingly enough, Comey didn’t appear the least bit intimidated by President Trump’s threat to release tapes of their conversations. And while Comey’s testimony combined with Warner’s read of the situation should be enough raise some serious concerns about Trump’s moral character, the GOP still keeps trying to refocus all the attention on the one detail that shouldn’t matter: the fact that Comey leaked his own memo. But what’s even more interesting is the fact that Comey never kept detailed memos of his conversations with Obama. But then again, that’s because he didn’t have to. During the hearing, Comey said that he felt the need to document his conversations with Trump out of fear that the president may “lie” about them later. “I was honestly concerned that he might lie about the nature of our meeting so I felt the need to document it,” Comey said. And it’s a good thing he did, because Trump has repeatedly denied allegations that he asked Comey to drop the investigation into Michael Flynn. But remember: Comey’s public testimony was only part one of the story. Comey is expected to discuss classified information during a private meeting in the near future. And if this is what Comey divulged in his public hearing, one can only imagine what he has to say in regards to matters that involve sensitive information.